* 1. I have read approximately ___ books relating to Borderline Personality Disorder. 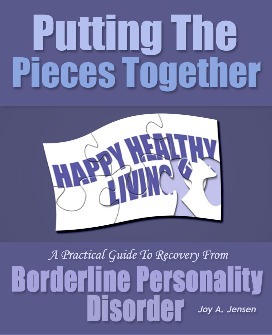 A Practical Guide To Recovery From Borderline Personality Disorder"
a governmental (city, county, state) agency. * 4. I (or my office) generally ______ refer patients/consumers to online self-help groups, discussion boards, forums, websites. * 5. To where should the review copy of "Putting the Pieces Together" be sent? to partner with BPDRecovery.com to produce and/or facilitate a series of online BPD recovery-oriented workshops. to purchase a copy / multiple copies of "Putting the Pieces Together." to be contacted about other BPD-related issues or topics. to provide signed copies of "Putting the Pieces Together" for my patients. to partner with BPDRecovery.com on a grant proposal, application, project or study. to share a voluntary research study with BPDRecovery.com members. to have the author of "Putting the Pieces Together" speak to my patients/consumers at a conference or on a live web-chat.